Students from Nova Scotia are in Ottawa this week meeting with Members of Parliament and Senators to call for a high-quality and accessible system of post-secondary education in Nova Scotia and across the country. Last year, the Canadian Federation of Students completed and issued a cross-Canada vision for education. Entitled “Public Education for the Public Good,” it is a coherent summation of the current state of post-secondary education and how easy it would be, but for a lack of political will among the powerful, to establish free post-secondary education in Canada. 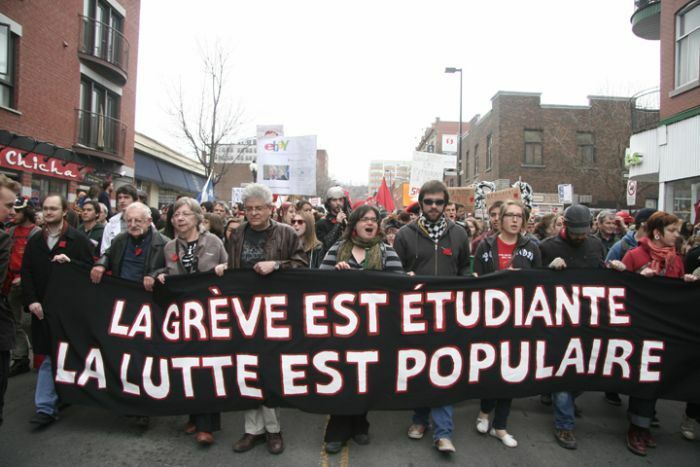 The Fall 2012 issue of Our Schools/Our Selves is about the links between education and activism, but it focuses extensively on issues raised before, during and since the Québec student strike. We express our warm congratulations to the Communist Party of Venezuela, President Hugo Chavez and the Venezuelan people for your tremendous victory in yesterday’s presidential elections. Education is a right, not a privilege! The unity and militancy of the Quebec student struggle has begun to shake the rest of Canada. Across the country, the youth and student movement has been inspired and emboldened by the struggle in Quebec. Many have correctly concluded that the best form of solidarity is to step-up a united fight back at home. The Young Communist League of Canada supports this growing mobilization, made stronger by work like the Casserole Night in Canada protests that heard post banging from Antigonish, Nova Scotia to Victoria, British Columbia; and here in Ontario, by solidarity tours like that organized by the Canadian Federation of Students – Ontario and the Toronto student strike workshops which drew in over hundred eager participants. University and college tuition fees rose almost four-times greater than the rate of inflation this year. According to data released today by Statistics Canada, tuition fees in Canada increased by 5% between 2011 and 2012, compared to inflation of 1.3% during the same period. Left with no other choice by an intransigent Board of Education and a politically ambitious mayor, teachers took to the picket line, declaring that the strike was for the kids, the profession and public education everywhere. This was a strike that changed the city.